Heat oven to 400°F. In large skillet, brown ground beef round with onion over medium-high heat for 8 to 10 minutes or until thoroughly cooked, stirring frequently. Meanwhile, in medium saucepan, combine water, butter and salt. Bring to a boil. Remove from heat. Stir in milk and potato flakes. Cover; let stand 5 minutes. Stir in green chiles and 1/2 cup of the cheese. Drain beef mixture. Add enchilada sauce, chipotle chiles, cumin and oregano; mix well. Bring to a boil. Remove from heat. Spread beef mixture in ungreased shallow 2-quart casserole. Top with corn. Spread potatoes evenly over corn. Sprinkle with remaining 1/2 cup cheese. Bake at 400°F. 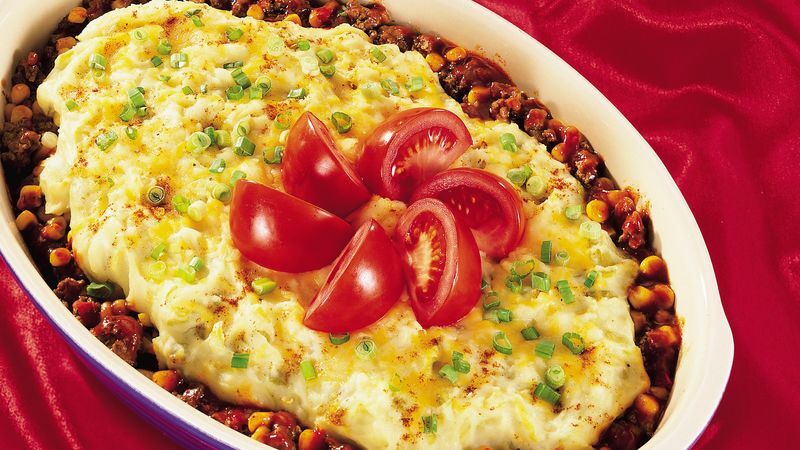 for 13 to 17 minutes or until cheese is melted and filling is bubbly. Sprinkle with paprika and green onions. Arrange tomato wedges in center of casserole. Let stand 5 minutes before serving.